Just outside the valley, the small town of Banepa is a busy crossroads, 29km from Kathmandu. It was an important stop on the trade route to Tibet and once even boasted diplomatic relations with China’s M.ing dynasty. 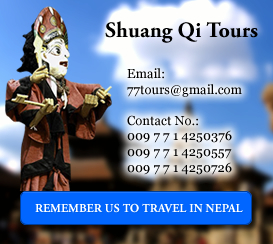 Dhulikhel is 5km to the east, the temple town of Panauti is about 7km south and Nala is 3km to the northwest. The pleasant squares and laneways in the older northwest section of Banepa are worth exploring. Right beside the turn-off to Chandeshwari is a pretty tank with basereliefs of gods at one end. Only 1km or so northeast of Banepa is the Chandeshwañ Temple. Legend has it that the people of this valley were once terrorised by a demon known as Chand. When Parvati, in her demon-slaying mode, got rid of the nuisance she took the name Chandeshwari, ‘Slayer of Chand’, and this temple was built in her honour. The temple is entered through a doorway topped by a brilliantly coloured relief of Parvati disposing of the demon. The triple- roofed temple has roof struts showing the eight Ashta Matrikas and eight Bhairabs, but the temple’s most notable feature is a huge and colourful fresco on the west wall of Bhairab at his destructive worst. The temple had been almost totally deconstructed in 2006 as part of its major renovation. The ghats below the temple. beside the stream, are an auspicious place to die and people come here when their end is high. Chandeshwari is not only popular in Banepa, but it is alo worshipped by the people of Kathnamdu Valley as one of its main guardian deities. Hindus know her as Chandeswari, the Mahayan Buddhists take her as one of the goddess of protection and call her Ekjati. Inside this temple are displayed terracotta images which belong to the fourth or fifth century A.D. It is believed that ancient terracotta images of this kind are very rare in Nepal . The temple of chandeswari is one of the temples of the Nepalese pagoda style. This 3 storied temple has popular tantrik figures an poses on the temple struts. There is a picture of Bhairab on the western wall of the temple which is considered to be one of the largest wall painting in Kathmandu Valley. At the front courtyard of chandeswari temple, the ancient shivalinga of chandeswari and sikhara style temple are not to be missed. Other than this the images of Ganesh and the other gods and goddess which are scattered here and there are also very attractive.